GEORGETOWN, Del. – Delaware State Police met face to face with state officials on Friday to bring crime, crashes and drug investigations to the forefront. 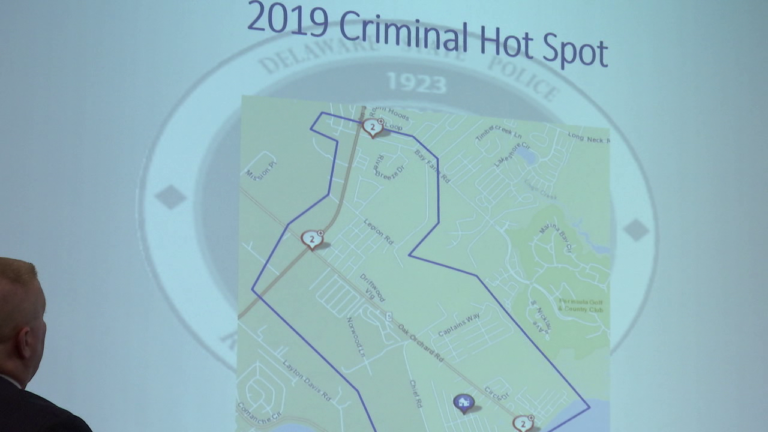 “We’re identifying our core crimes, what crime drives us in our troop territory and those are the burglaries, the thefts and the robberies,” said Captain Rodney Layfield at Delaware State Police Troop 4. According to Layfield, a State Police Enhanced Analytical Response Model has cut crime in half this past year. “We’re targeting when the accidents are happening, or when the crime is happening, so we’re using that evidence-based analytical data and strategically place troopers at what time we want them there and where we want them,” said Layfield. “I’d say within the last year, the state police have been doing a hell of job,” said Hank Liket, a resident at Oak Orchard. According to reports, Oak Orchard became a major hotspot for crime and drug arrests in past years, but residents said police stepped up their efforts. “The reason for these crimes is people trying to get drug money, like a couple years ago my wife’s car was broken into right here in my driveway and all they stole was change,” said Liket. “We were seeing an inordinate amount of crime in Oak Orchard, and about three to four year ago, we were seeing about 200 complaints a month in the Oak Orchard area,” said Layfield. On top of that troopers and legislators said the number of accidents went up last year, and that is because more people are staying in Sussex County. But, officials said they are putting new plans in place moving forward. “We need to look at what types of changes need to be made whether it’s signage, installing lights, turn lanes, altering the geometry of the intersections, so that you can see better when you’re trying to cross,” said Republican State Senator Brian G. Pettyjohn.